I really enjoyed reading this book, probably the best endorsement I can give for a technical book. The authors introduced the common computer science algorithms that you would expect in a good desktop reference, giving each a block of pseudo code, some analysis of algorithmic complexity and implementation trade-offs, and finally a proper implementation in a standard programming language (usually Java). The later chapters cover slightly more advanced techniques, typically with a practical example. My favourite was their randomised algorithm for estimating a solution to the famous “n-queens” problem (developed by Knuth in 1975). I assumed that the great algorithms would fall into two catagories. The first category would be algorithms with some simple yet clever trick at their core – a trick that could be explained without requiring any technical knowledge. The second category would be algorithms that depended so intimately on advanced computer science … Imagine my surprise and delight when I discovered that all the chosen algorithms fell into the second category! 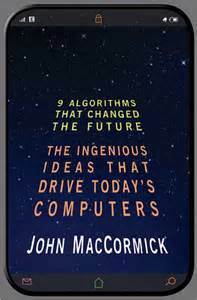 The book is a fun read and despite knowing some of the details already, it helped to build my appreciation of the algorithms and their applications. There’s also an excellent chapter on unsolvable problems, with a nod to Alan Turing. Whilst I haven’t used std::rotate or std::stable_partition, I’m sure to use these two algorithms built on top of them, probably because their behaviour is so much easier to describe.